The hilly and technical last TT of the 2018 Tour de France was always going to be high stakes for GC hopefuls—and rain early in the day made for tense watching. Yet the favorites for today’s stage did not disappoint: Tom Dumoulin won by the smallest of margins to Chris Froome. And yellow jersey Geraint Thomas set some of the fastest splits to hold on to the overall win. It was a hard course for riders battered by the heat and hills of France, but it certainly brought the best to the fore. After being at the service of his team leader for the past 3 weeks, Michael Hepburn had the opportunity to get a big result in this individual event. He made the most of it with a blazing time, and held the lead for nearly two hours as other riders rolled in. In the end he came out with a fantastic 10th place. Michael is known for his Time Trial powers, with many wins and podiums over his Junior, U23 and now Professional career. Yet (as is often spoken of in grand tours) success in the final TT is not always down to people with pure TT ability; it’s the riders with some fitness and freshness left (which Michael clearly had). We don’t often get to see the exact data from the warm ups of the world’s best, so it is something of interest to see what Michael did in the lead up to the TT. Immediately after the start village riders faced a long drag leaving the town. It was on this first 3km uphill of 3-4% that Michael lay down the effort which gave him the fastest splits at the early checkpoints. He averaged 450w, 5.84w/kg, a pace which he held very static along this section of road. It’s likely that he was being careful not to go into the red, which would have caused big problems later in the stage. With little interference from corners or steep descents, Michael really opened the throttle after the small village of Etxehasia. It was through this village and out the other side that Michael did his peak 12min and 5min powers for the stage. 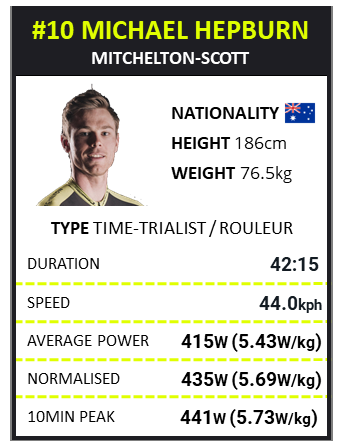 His 5min power was an impressive 468w, 6.08w/kg; a big ask after having already done around 15min at 5.5w/kg. One of the big ‘obstacles’ of the day was the very steep 10% climb at the end of the stage. This 900m climb punished riders who had paced badly during the opening sections and had too little left in the tank. Thankfully, Michael again hit his target and made a great effort over the climb, maintaining his power and rhythm. He also produced his peak 1min power for the day on the lower slopes of the climb: a very solid 535w, 6.95w/kg, which gave him momentum over the remaining part of the hill. Coming off this climb, the riders had to leave everything on the roads as they were only a few kilometers from the finish. It was on this very fast run into Espelette that Michael hit his top 1min average speed (69.7kph), and peaked at 79.7kph. Spinning at 110rpm, Michael averaged 448w, 5.82w/kg as he squeezed out every last bit of energy for the finish. Being able to produce a 5.5w/kg effort for 40+min is impressive at any time, but doing it after 3 weeks of racing is something few people can achieve. This performance not only shows Michael’s ability to TT with the worlds best, but it also shows that his fitness will be on the rise in the coming months. 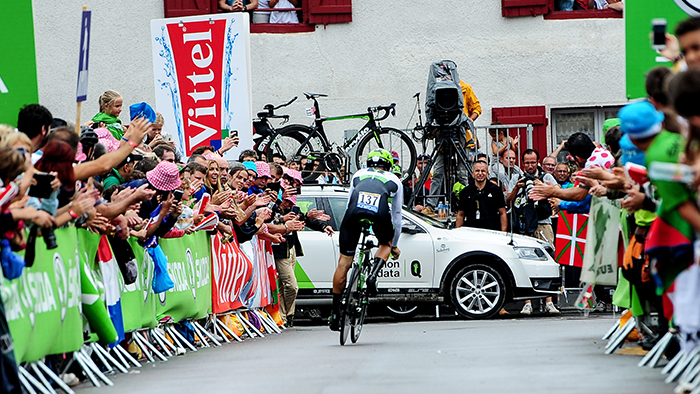 It shows great resilience to get through the Tour and still put out a performance like this in the last few days.